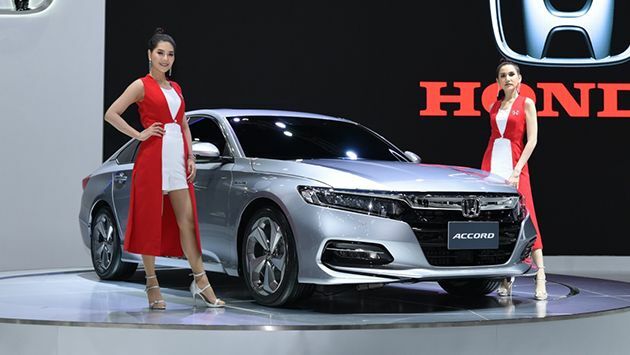 Aside from the debut of the facelifted Civic, Honda Thailand has also previewed the new Accord at the ongoing Thai Motor Expo in Bangkok, more than a year after the car was revealed in the United States. The tenth-generation D-segment sedan is set to be launched in the Land of Smiles early next year. Very little details have been released so far, and the Accord was even shown with blacked-out glass to prevent prying eyes from getting a glimpse of the interior (much like what Honda Malaysia did with the facelifted HR-V). This does, however, confirm that the ASEAN-market Accord will have the same design as the US market, just as we’ve seen with the Civic. Honda Thailand has also confirmed that the Accord will be offered there with a turbocharged engine, as well as in a hybrid version with the brand’s Intelligent Multi-Mode Drive system. Like the CR-V, it will also get the full Honda Sensing suite of safety features, including Collision Mitigation Braking System (CMBS), Lane Departure Warning, Road Departure Mitigation and Adaptive Cruise Control with Low-Speed Follow. In the US, the car is available with either a 192 hp/260 Nm 1.5 litre VTEC Turbo engine or a 2.0 litre version making 252 hp and 370 Nm of torque, while the Accord Hybrid pairs a 143 hp/175 Nm 2.0 litre naturally-aspirated, Atkinson-cycle i-VTEC engine with a 181 hp/315 Nm pair of electric motors to provide a total system output of 212 hp. We’re betting on the 1.5 litre turbo model being the one that will be sold here. Will it be the new king of unreliable LED daytime running lights like the current Accord when it is launched here? When it comes out from the local honda’s useless quality control plants, I bet it will be more of the same. A comparison of 3 Japs in USA has placed the new Accord as the overall winner.2nd place goes to Altima & last is Camry. Yes Honda Malaysia, please price your new 2019 Accord wisely. Don’t put crazy prices for your accord to us Malaysians. Also please spec the cars well with full spec for the range topper. The 1.5T with CVT replaces the old 2.0 vti/vti-l accord, price should be in the range of RM140k-RM148k. Then the 2.0T with 10 speed button shifter should replace the old 2.4 vti accord, price should be the same as RM165k-RM168k. With this price, we Malaysians will buy alot of the new Accord. Do you mean on the new facelift model? Was it really that bad? Mine is the pre-facelift and so far the running daylights are still okay. Hear that???? Unkers are bringing out the cheque books to place deposit even before price announcement. Hopefully, Honda Malaysia don’t give this to Proton to make the Accordana. According to Honda sales people, once their Honda Accord became Accordana for Proton, their own Honda Accord had plumetting sales because prospective buyers were shy to own Honda Accord. Sedih betul, pay RM150k Honda Accord and the Proton Perdana only cost RM113k. 1 year old Accordana even worse RM70k. Disappointed that the first image of this post is not original. Why is paultan.org not at bangkok? Outside is so ugly, Honda haven’t had any nice design lately, inside is ok but dated. Woot incoming fugly monster. What have they done to the Accord legacy? Dunno, but the current Accord looks better. The current design trend is the sculpted or ‘shrink wrap’ door side panels, not the inflated sides for the new model that makes it look, well, big like a boat perhaps. Oh yea! The Accord is coming! Looks… somehow not so sure… Erm… Well… Its equip with a better engine now. Honda preview latest accord in Thailand while not even bother to put a display at Klims. Finally!! Pls bring the 2.0 turbo version pleeeaseee!!!! can’t for it be “reEngineered” by Proton…. 2019 model, light bulb signal indicator. nice! Honda Malaysia, you better bring in the 2.0T with the 10 speed button shifter into Malaysia. Proton Perdana long time ago already dead & buried. The design slightly the same with Proton Perdana especially at the back.